Read Axel Scheffler’s acceptance speech for the inaugural Illustrator of the Year Award at the British Book Awards, held in London on 14 May 2018. “I am very grateful to receive this inaugural Nibbie for illustration. I’d like to thank my three main publishers: Macmillan, Scholastic and Nosy Crow; Kate Wilson, who has published me for thirty years; Julia Donaldson, with whom I have forged an extraordinary – and extraordinarily successful – partnership; and I’d like to thank readers – the parents and the children who have grown up with the books I have illustrated; and The Bookseller and the judges who chose me, a foreign EU citizen in Brexit times – that’s a nice gesture. The UK has been my home for 35 years. 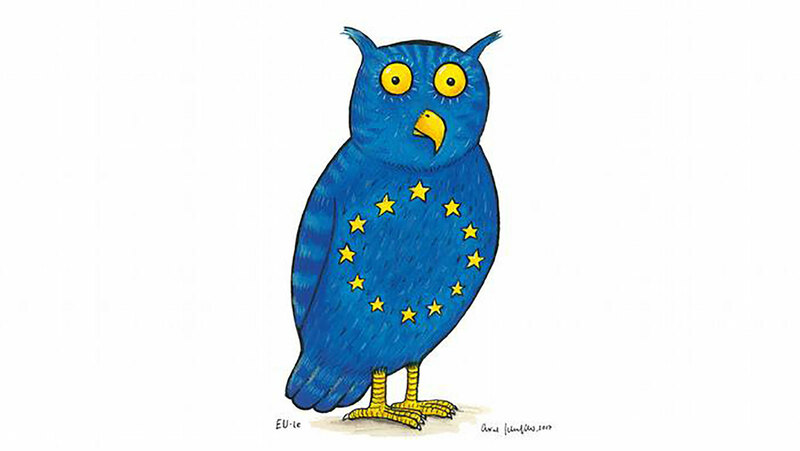 There would have been no Gruffalo without the EU facilitating my study here. And, even if I had, somehow, studied in the UK, I would have had to leave after my studies ended in 1985. So there would never have been the successful Anglo-German joint venture Donaldson-Scheffler. I know that my contribution is acknowledged here tonight, and, once again, I am grateful. "So beware, Brexit Britain – if you have no friends in a hostile environment – the dragons may come and get you." The exhibition, Drawing Europe Together, is a vibrant collection of artworks by 45 of the best-known children’s book illustrators from across the UK and Europe. They have collaborated to make illustrated comments on the historical and possible future relationships between the countries of Europe, many of which are extremely touching and heartfelt. Click here for more information on the exhibition. Drawing Europe Together is a passionate, heartfelt exploration of Europe and what it means to the people who live and work in its borders. With contributions from artists from Quentin Blake to Emily Gravett, Drawing Europe Together showcases illustrations from 45 renowned illustrators who share their visions of Europe in this beautiful collection.